Supports Palo Alto firewalls running PAN-OS version 7 or higher. 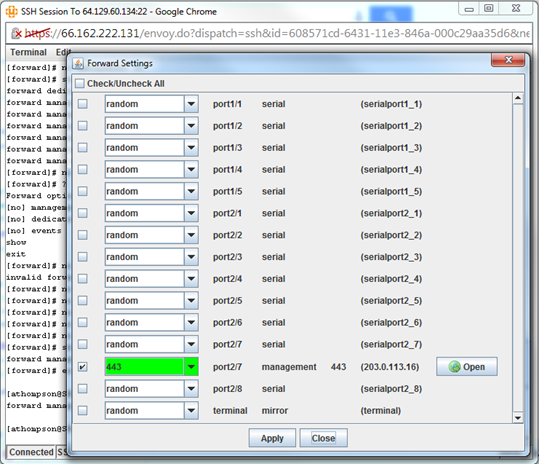 To save the Palo Alto’s configuration to the LM, navigate to the port that the Palo Alto is connected to and run the either of the following commands, substituting the LM’s IP address. Next, run one of the following commands, substituting the LM’s IP address. Upon entering one of those commands, the LM will connect to the Palo Alto’s CLI, transfer the candidate configuration, and apply the configuration. The Local Manager can be configured to monitor the status of a managed Palo Alto using the PaloAltoChassisRules rule set. The LM will check the Palo Alto for environmental alarms and high CPU usage. High CPU usage or system heat will trigger an alarm on the LM. action alarm GENERIC -a "CPU usage above 0%"
action alarm GENERIC -a "free memory below 1000000"
action alarm GENERIC -a "disk usage over 80%"
Users may now connect to the web interface through an SSH tunnel using the port forwarding feature. In the SSh applet on the Control Center, click Terminal, then Forward. Select the Palo Alto’s port, enter 443 for the port number, and click Apply. Now, port 443 on 127.0.0.1 on your workstation will connect through the SSH tunnel created by the LM to the web interface on the Palo Alto.